Just as an arm guard is a must-have for the serious adult archer, it is also a must-have for the young archer. String slap is unpleasant and annoying at the best of times, and these youth arm guards serve as a layer of protection that will keep your young one from feeling the sting of the bow string. Plus, many of our kids arm guards also have cool designs, and that is sure to appeal to a child as well! 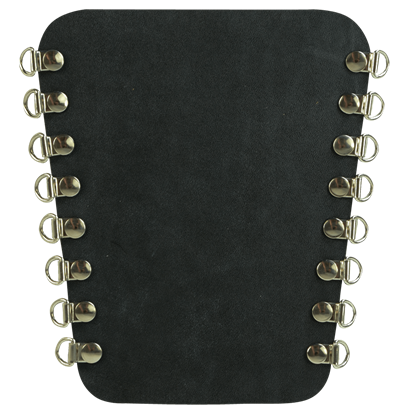 Every one of our childrens arm guards are crafted entirely from high quality leather, and many are made right here in the United States. They are worn on the forearm that holds the bow, and each one is independent of orientation (they are not left or right-handed). A plain archers arm guard is a perfect choice for the traditional youth archer who prefers a more historic look, while any number of our heraldic, stylized, or fantasy based arm guards will suit the fanciful and idyllic taste of other children too. Worn on the arm, a youth arm guard from Medieval Archery will not only help keep your child safe while they practice archery, but it will also allow them to show off a cool accessory unique to their look while they do so. Our Plain Archers Arm Guard is perfect for traditional archers looking to stay period dressed. Our arm guards are hand made from quality 7/8 ounce leather and provide just the protection you need when shooting your longbow or recurve. As skilled as their archers were, those from Middle Earth still sought to protect their arm from the snap of a bowstring. 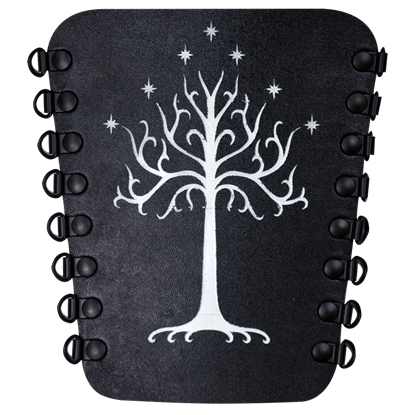 When you put on one of these White Tree Archers Arm Guards, you will feel just like a bowman from Gondor.